Tomorrow, I shall once again return to the Western Isles, and it will once again be a long journey. The 625 miles will take me 12 hours, including a 5-hour stopover in Glasgow. I'll be tucking into a 700-page work of fiction, the Sword of Shannara by Terry Brooks. I am dreadful for re-reading books, but this one is worth going through again. You have to like the genre, it is a spin-off of the Lord of the Rings by Tolkien. Nowhere near as good, but I have read far worse. The circle of the year is now closed, the year since my mother died on 1 May 2008. It's naturally not been an easy 12 months, and this loss has had its impact along the way. Such is life. Normal updates will resume on Atlantic Lines on Tuesday, 12 May. This blog will now be dormant, until such time that I have need of it again. Thank you for reading. Sixty-nine years ago today, the armed forces of Adolf Hitler's Nazi Germany crossed the border with the Netherlands and proceeded to invade the country. The major rivers did not prove too much of a hindrance, in spite of some of the bridges being dynamited, and within a day or so, the German invasion force was threatening the Dutch heartland from the south. 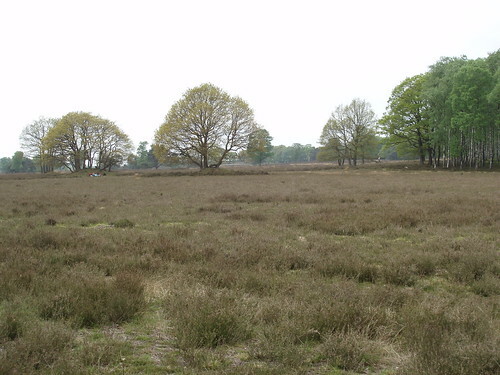 Stiff resistance at the eastern line, east of Utrecht, meant that the advance was halted there - temporarily. The famous German airforce, the Luftwaffe, suffered grievously at the hands of the Dutch air defences, both from the ground and in the air. On May 14th, the Luftwaffe carried out a bombardment of the port of Rotterdam, setting the centre of the city ablaze. 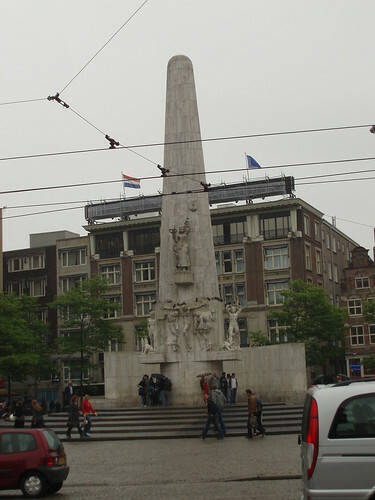 Threats with similar actions against the other three largest cities in the west, Utrecht, The Hague and Amsterdam, forced the surrender of the Dutch. They had managed to eliminate a third of the Luftwaffe. Queen Wilhelmina had crossed the North Sea to England, and the Germans started to impose their reign. Although initially things did not appear too bad, they very soon became bad. Restrictions on Jews were gradually imposed, and in February 1941, a strike was called in Amsterdam. This was put down brutally, leaving nine dead. In the following years, more than 100,000 Jews were deported to the concentration camps and gas chambers in Germany and occupied Europe. In 1945, the Nazis finally surrendered. By then 20,000 had died of starvation in the last winter of the war. The south of Holland had been liberated, but not the area north of the great rivers. There, a railway strike was in operation, meaning that all transport was halted. Massive food shortages ensued, which saw people reduced to eating flower bulbs. Humanitarian food drops were organised, but that did not amount to much. Other people walked 100 miles to the east to buy food with their jewellery, at extortionate prices. May 10th is not observed or remembered - it was a chance comment of my father, who said the weather today is much like it was 69 years ago, that reminded me. A very late posting today, but I've been reasonably busy. First of all, I went to town to buy a few bits and pieces for taking back to Stornoway on Monday. I also bought some roses, which I left on my mother's grave in the afternoon. The ones I left there a week ago were wilting. 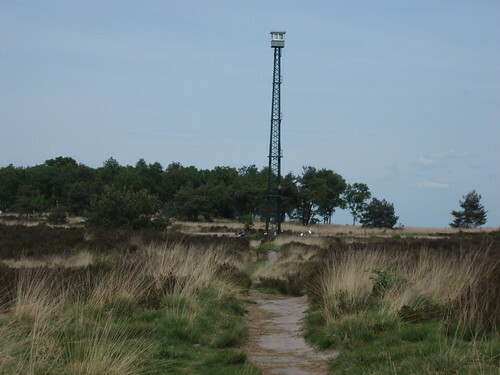 Afterwards, I went with my father on a walk round the Heathlands. It was a nice, sunny afternoon with a breeze. Not overly warm. We first went to the Emma Pyramid, a look-out tower built in the 1920s as a work generation scheme at the time of the depression. You can look southeast, across the Rhine river valley all the way into Germany. The city of Kleve can be discerned in the distance. Its Dutch neighbour, Nijmegen, is closer by, marked by the bulk of the power plant that lies on the riverfront there. 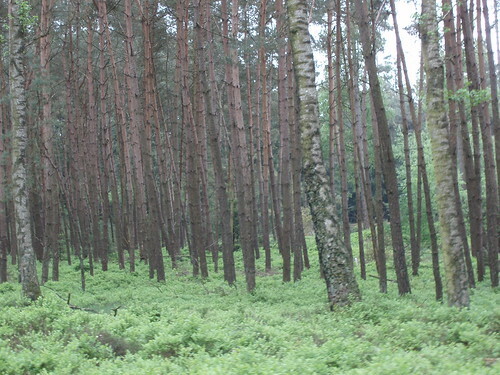 Hidden amongst the trees is a small memorial to a dozen young men, aged between 19 and 35, who were summarily executed by Nazi forces in December 1944. They were remembered in a small ceremony last Monday. 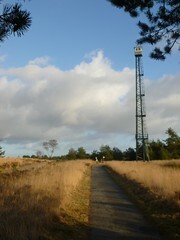 We then wound our way to the Watchtower, a look-out post manned until 1960 to spot heathland fires. 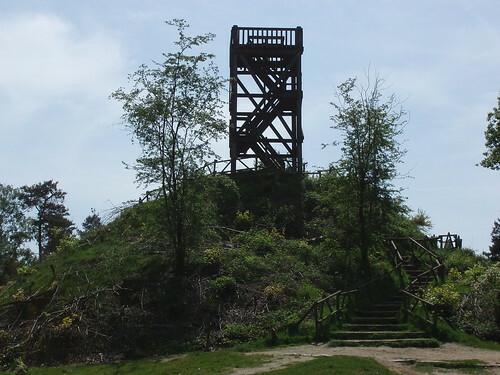 Spotter planes were used from that year onwards, but the Watchtower (Brandtoren in Dutch) was restored a few years ago. You cannot go to the top level (too dangerous), only to the first. We returned home just before 4pm, by which time the sun had disappeared behind high- and medium-level clouds. Quite a bright day, but cloud is increasing as is the wind. The Hebrides had a force 9 gale yesterday (according to my contacts there), so my force 5 to 6 is nothing in comparison. The rainfall radar shows a line of rain marching into the western provinces as I type, and it will be here before 6pm (it's 4.20pm now). As I've already mentioned on Facebook, I'm rueing my 11 mile foray from yesterday - on account of severe cramp - but would not have missed the walk for anything. If you want to see more pictures, you can nip over to my alternate Flickr-account. Tonight, a remembrance service will take place in Apeldoorn, to remember the 6 people killed on April 30 during the Queen's Day parade in that city. A man drove his car through spectators at 60 mph, killing four on the spot, two died later in hospital, as did he himself. The service, in Dutch, will be relayed on http://www.nos.nl from 20.25 local time, that's 18.25 GMT. Promised some piccies from today's walk, so here goes. Deodorants, if not used appropriately, can be very harmful to health, as two teenage boys have found out to their cost. A few months ago, a lad of 13 actually died after he covered his entire body in the stuff. Now, German newspaper Bild (the German equivalent of The Sun in the UK) reports that a teenager of 17 blew up the hotelroom he was in by lighting a cigarette. He had been sniffing the deodorants to get a 'high' (solvent abuse), but had been doing it so much that the atmosphere in the room was at flashpoint. He is now in hospital, being treated for serious injuries, which he sustained in the blast. The man who was responsible for 6 deaths, as well as his own, by crashing into the Queen's Day parade in Apeldoorn a week ago was buried yesterday. It was attended by ten members of his family. They have expressed their total bewilderment and incomprehension how their family member went completely crazy. The Royal Family are also still traumatised. Pieter van Vollenhove, the Queen's brother-in-law, actually celebrated his birthday on 30 April (he turned 70). Speaking at a conference on safety, he admitted that he was still struggling to come to terms with events on that day. Queen's Day, a day of harmless frolic and fun had now lost its innocence. It would continue, but not quite the way it always was. Tomorrow, a service of remembrance will be conducted at Apeldoorn. It will be broadcast live on national television. It will hopefully bring some sort of closure to the immediate aftermath of that traumatic day. The reverberations of the events on Queen's Day 2009 will continue to be felt for years to come. Before we were kicked off AOL (who are they again? ), I used to write this blog under the screenname of veluweman. 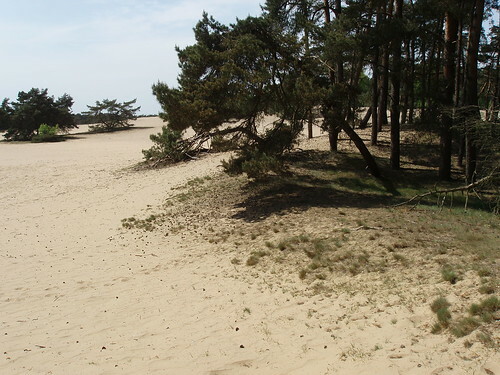 Veluwe [pronounce: Fay-lew-er] is the name of the large area of wood and heath, stretching the 45 miles from Arnhem to Zwolle in eastern Holland. 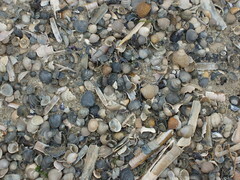 Today, I went on a foray right across the southeastern part of the area, in the company of my father and sister. At 11 o'clock, we jumped on the 43 bus from Velp (our nearest sizeable town) all the way to Loenen, which is 13 miles away to the north. On the way to Dieren, we noticed the stork nest on a tall pole in full use; one bird was incubating, whilst the other was standing guard. 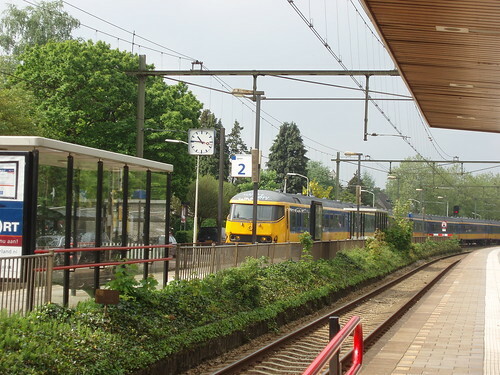 After stopping for a while outside Dieren railwaystation, the bus continued round Dieren town centre, then on through the villages of Laag Soeren and Eerbeek to Loenen. Arrived there at 11.45. After a cuppa, we went on our merry way back at 12.15. 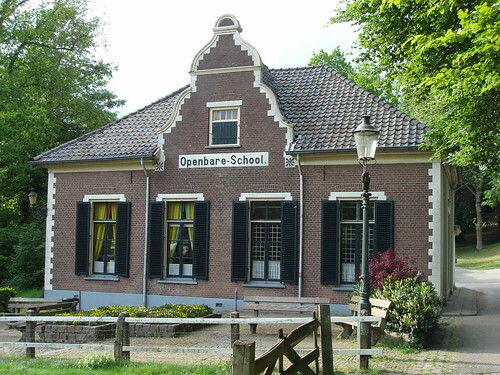 We followed a cycle trail as far as the Eerbeekseweg, the halfway point near the hamlet of The Imbosch. 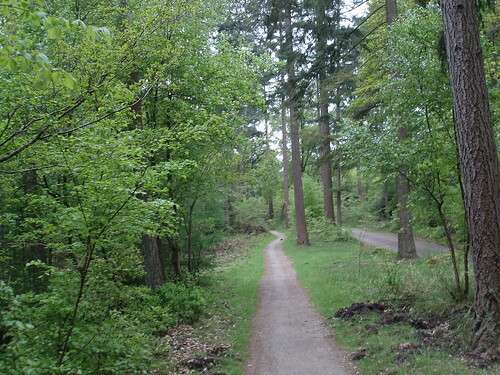 It was quite varied, passing through woods and open heathlands. The mile or so along the Eerbeekseweg, an unmetalled road with cycletrack, was less than inspiring. 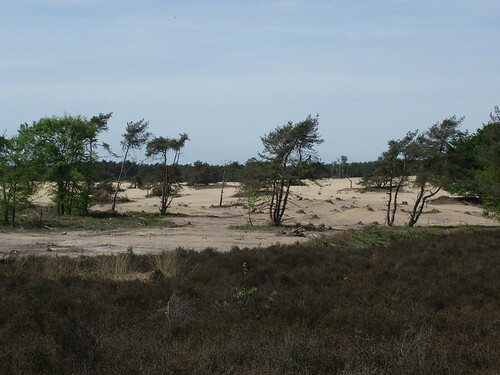 Once at The Imbosch though, we could veer off the beaten track and make our way south across the Heathlands (as I call them in translation). It was quite busy with walkers and cyclists (it's a holiday week), but nobody beyond The Imbosch. The clouds had dissipated by then, and it got quite warm. Formal reports from Deelen AFB, 6 miles away, state we got up to 18C / 64F this afternoon. Returned home at 5pm. 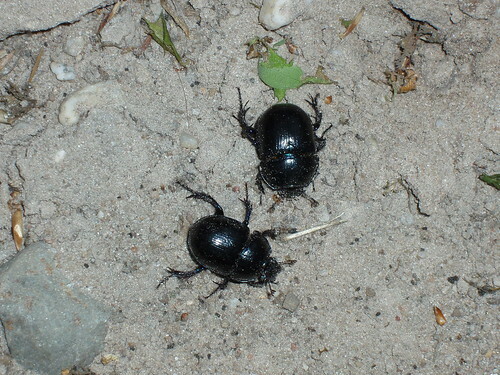 Heard five different cuckoos, saw plenty of flowers, trees in leaf, dung beetles and ants. Once more late at night - the moon is shining brightly from behind dissipating clouds. 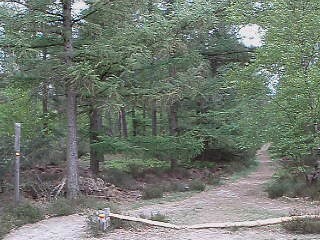 Tomorrow, I am going on a long walk with my dad, which means I won't be on here much before late evening probably. 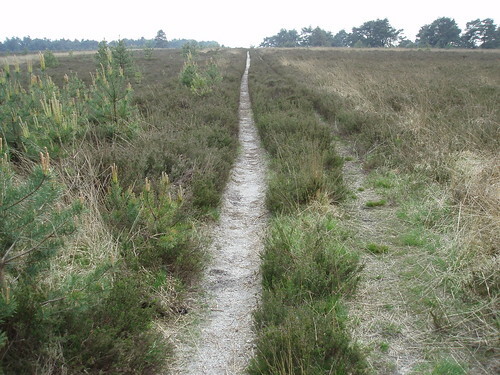 Need to go on a bus first, then walk back across 10 miles of the Heathlands. Also am attending a choir practice for the church service on Sunday, so that has me covered for most of the day. I spend too much time on here at any rate. It is brightening up, after a thoroughly miserable and wet morning. I make no apologies for watching three episodes of All Creatures Great and Small on DVD. I know Swaledale and Wensleydale, the area of North Yorkshire where some of the stories were filmed, quite well. Currently catching up on matters internet. Barack Obama has taken Holland off the list of tax paradises, after an intervention by the Netherlands Embassy in Washington. Wonder whether Bermuda and Ireland are also going to remonstrate with B'rack to the same effect. Yesterday's Liberation Day celebrations descended into violence in Rotterdam, when two rival groups decided to have a go. The police intervened, but was then set upon by the combined force of the groups - requiring the firing of warning shots to break things up. Dutch police are armed as a matter of routine. Twenty to one in the morning, and I'm still at this machine. Chatting to friends, catching up on blogs, tweets, events in my region in Scotland. I read that a councillor in the Western Isles got his Gaelic badly wrong, and instructed his fellow councillors to remove their clothes, rather than his intended injunction to switch off all mobile phones. This blog is a lot to do with looking back, and today will be no exception. A year ago, I was preparing to leave Lewis for the first time in more than 3 years to return to Holland for my mother's funeral, the anniversary of which will be this Friday. Barack Obama has declared that The Netherlands are a tax haven, along the lines of Ireland and the Cayman Islands, used by US firms to avoid paying tax in their homelands. Measures, expected to yield $20bn, will make it more difficult for those companies to use that route. Fair enough. Except that the Dutch government has expressed its disappointment, and will be seeking clarification from Mr Obama. And ask for Holland's name to be removed from the list, thank you, Mr President. Private individuals wouldn't agree that there tax laws are lax out here; it is more amenable for corporations. However, to rank the Netherlands among the likes of the Cayman Islands is way off the mark. Not really the way to treat an old friend, is it now? I've been favourably inclined towards Mr Obama since his election last November. This is a bit of a hoist of one's own petard, I think. The US president came to office on a ticket of change. If he can manage to persuade Americans that paying taxes is actually for their own, individual good (by spelling out what is being done with their tax dollars), he might actually see an increase in tax revenue. For the moment, I do not detect a lot of change in attitude, judging by what my American fellow-journalers are writing. To summarise: Mistrust of government, and a perception that they don't pay taxes to turn America into a socialist paradise. On 5 May 1945, Nazi German forces occupying Holland surrendered at Wageningen, 15 miles west of Arnhem. Today, 64 years on, this was celebrated nationwide. Celebrations were more muted than in previous years, on account of the attack in Apeldoorn on Queensday, 5 days ago. 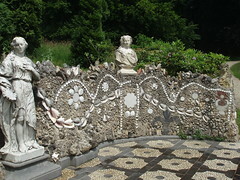 Thirteen festivals had been organised across the country, with Prime Minister Balkenende opening the one in Zwolle, 45 miles north of Arnhem. This evening, a music festival on the river Amstel in the heart of Amsterdam had been toned down a little, although there was still plenty of swing left. George Gershwin took care of that. Queen Beatrix attended the event, off the Magere Brug near Carré Theatre, to the delight of the crowd lining the canal. Stringent security measures were in place, but the Queen definitely enjoyed the event, as was shown when she sailed off in a Harbour Office craft, waving and smiling at the crowd. The three central events in the Dutch calendar are now over for another year. They were noteworthy this year. Some would say for the wrong reasons, and that would be true. However, resilience is already showing through, and I would like to think that the country will emerge stronger and more unified out of this. Queensday / Koninginnedag will be back in 2010 - and not a lot changed in its format. More security, yes. But in essence, the same merriment and fun. Is less than useless. On 30 April, I was blocked from posting for 1 hour for excessive posting. So, I queried it with Twitter Help. I get a link back from them, pointing to a help page about blocking other people. They didn't read my question at all, just spotted the word "block" and carried on on autopilot. How mediocre can you get, leaving to one side the fact it took them 5 days to get back to me. At 8pm, two minutes' silence was observed across the Netherlands to remember those people from this country who had died in the Second World War, and in war and peacekeeping operations since. As per usual, Queen Beatrix attended together with the Prince of Orange, Willem Alexander, and his wife, Princess Maxima. Not as per usual, her presence was specially acknowledged by the Mayor of Amsterdam, and certainly most unusual, the 15,000 strong crowd on the Dam responded with a prolongued round of applause. For the past 20 years and more, I have made a point of observing both the Dutch and the UK Remembrance Days. I feel that the sacrifices made by British armed forces and people alike in the Second World War contributed in no small measure to the liberation of Holland and other countries in Western Europe that were under Nazi German occupation and all the horrors that that entailed. The Acts of Remembrance in Holland and Britain are quite different. The focus in the UK is strongly on the servicemen that made the ultimate sacrifice, or endured great suffering. In Holland, military sacrifices are also remembered, but there is a different angle as well, because the country was occupied. 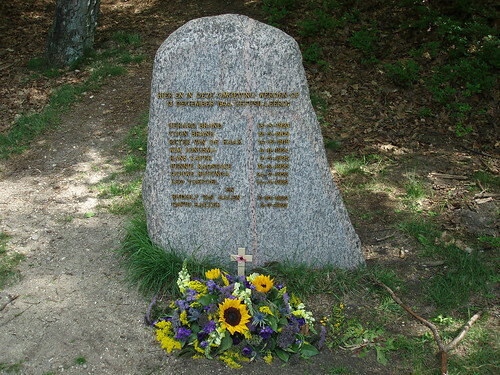 During the Nazi occupation, many people were summarily executed, and two of the other commemorations in my area, earlier in the afternoon, focused on two locations where people had been shot by the Nazis. 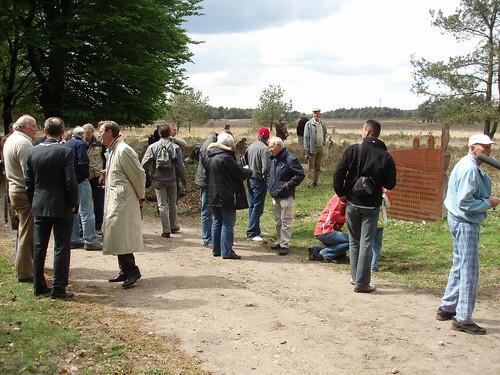 One of the national events, also at 8pm, takes place near The Hague, where many hundreds fell by the occupier's bullet. About 102,000 people were taken to concentration camps, like Amersfoort, Vught and Westerbork, thence to be deported to places like Auschwitz, Mauthausen, Dachau, whose names are now tinged with the infamy of the horrors that took place there. The name of Anne Frank epitomises what happened there - those who have visited Auschwitz get a faint glimpse. I have personally not visited Auschwitz. I don't think I could handle it, if I'm honest. Tomorrow is Liberation Day, when the Nazi yoke was finally lifted off the Netherlands. VE Day, with the final surrender of Nazi Germany, occurs on Friday, 8 May. 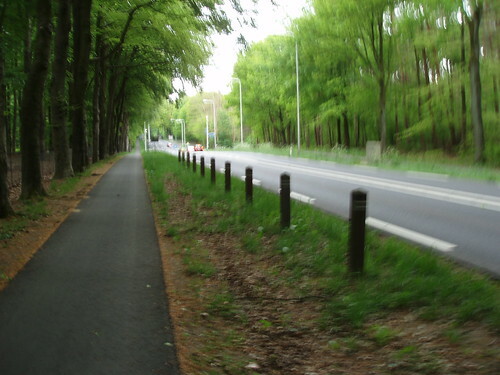 This afternoon, I climbed on the bike and pedalled the 7 km / 4.5 miles north to the Eerbeekseweg. There, you'll find a memorial to the crew of a Lancaster bomber which crashed there during the night of June 14th/15th, 1943, with the loss of all on board. 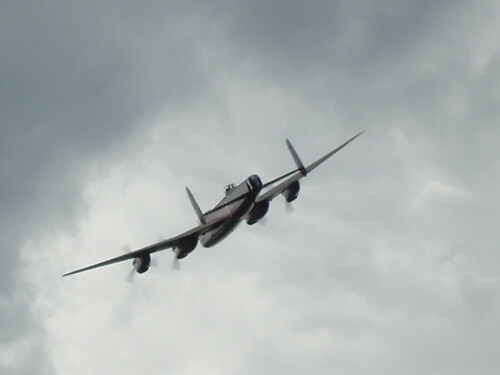 This year, a restored Lancaster flew over the crash site - three times, as opposed to the promised twice. The crew probably realised that there were more than 50 people (including myself) to see them. Afterwards, the mayor read out a statement on behalf of us all, acknowledging the sacrifice made by the crew to enable us to live in freedom today. Good morning from a slightly chilly Holland. Today is Remembrance Day over here. Back in 1945, it was the eve of Holland's liberation from the occupation by Nazi Germany, which had lasted for 5 years. Nowadays, the whole country comes to a standstill at 20.00 hours for 2 minutes, while we remember the dead of the Second World War and all conflicts involving the Dutch military since. Queen Beatrix will lay a wreath on behalf of the nation at the National Monument on the Dam in Amsterdam - pictured left. Members of the government and armed forces, as well as veterans and private organisations and individuals will follow. Simultaneously, other ceremonies will happen across the land, from Texel to Vaals, from Sluis to Schiermonnikoog. This afternoon, a restored Lancaster bomber will fly past over several key locations in the provinces of Limburg, Noord Brabant and Gelderland - I'm in the latter province. I hope to see it when it flies over the crash site of another Lancaster, which came down 5 miles north of here in the Heathlands in 1943. Many other countries observe Armistice Day, 11 November, as that was the day that the Great War came to a close. Holland was neutral in that conflict, although it was not unaffected by it. One of my research projects in Lewis was for an internment camp in Groningen, where 1500 British servicemen were held, including 105 Lewismen. I make a point of marking Armistice Day, as it is so important to the nations that helped to liberate Holland from the yoke of nazism in 1944/45. Tomorrow is Liberation Day here, again the 64th anniversary of the signing of the surrender of all German forces in the Netherlands. This happened in Hotel De Wereld in Wageningen, 15 miles west of here. The surrender was taken by Prince Bernhard, the husband of the late Queen Juliana. Bernhard, a German by birth himself, did not bother to return the salute from the German officers when he entered the room where the ceremony was to be held. He was a war hero, the CO of the resistance movement in Holland during the years of occupation. A few images from around the village. Those who read this journal a year ago will be familiar with the general scenery. It is very green, and it's the light green of early spring. 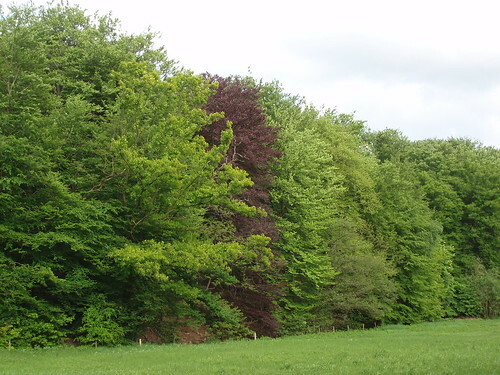 The beech leaves will soon turn a darker hue of green as spring turns into summer. As I have mentioned on this journal, the annual Queensday celebrations in Holland were marred by a man, crashing his car into a crowd of people and some barriers at 60mph. He killed 6, and later succumbed to his own injuries. Why, nobody knows. I watched the crash happening live on TV. I heard two dull thuds, the sound of breaking glass. The TV camera swung left and focused on a small, black car, which was racing across the junction at 30 mph or more. A police cyclist just managed to get out of the way. A photographer's ladder was swung aside. The car's windscreen was already caved in. We could not see the carnage left behind through the TV cameras - that came later. Stunned, the royal family in their open topped bus looked on. Aghast, some put their hands to their mouths at the appalling scene that met their eyes. The Queen averted her gaze after one glance. At that point, 4 people were already dead. After a few minutes, I got my laptop out, logged onto Tweetdeck and opened a search panel for "koninginnedag" and "queensday". As details came in, I entered them on Twitter, preceded by the aforementioned hashtags. I have not counted the total number of posts, but I think it's in excess of 300 for that afternoon. At one point, I was a leading trendsetter on Twitter, and I was being referred to as 'the' source for all the information. Rumours started to fly around, and I got a bit scared when someone posted the personal details of the car's owner. That's not allowed on Twitter, and prejudicial at the very least. Fortunately, the address details were out of date. It was an address only a mile away from me. By 6 o'clock, Twitter had enough of my postings and banned me for an hour. That was also the time that the more acute phase of the event came to a close. I had a few compliments for the solid coverage - it was a simple case of watching television non-stop and putting each and every bit of detail on Twitter. It was my way of coping with the shocking events of the day. Trying to help others, desperate to find information - perhaps with family or friends on the scene. I hope it did. help. Tweetdeck proved invaluable - the search column, which is still open, gave me all the tweets as they came in (if preceded by the hashtags #koninginnedag and #queensday). Joined my father in church this morning, and also joined the church choir, knowing how short any choir is of tenors. Yup, that's me. The vicar pointed out the further merits of the 23rd Psalm, other than one sung at funerals or sad occasions. As I type this, it is raining nicely, something that is actually needed. Tomorrow's weather should be a lot better, which would help in Remembrance Day events. Remembrance Day in Holland is celebrated on 4 May, being on the eve of the day the country was liberated from Nazi occupation in 1945. At 8pm, a nationwide two minutes' silence will be observed. In the afternoon, I shall be joining people in the Heathlands at a memorial to a crashed WW2 bomber. One of two remaining Lancaster bombers will conduct a fly-past in honour of the crew of the crashed Lancaster. 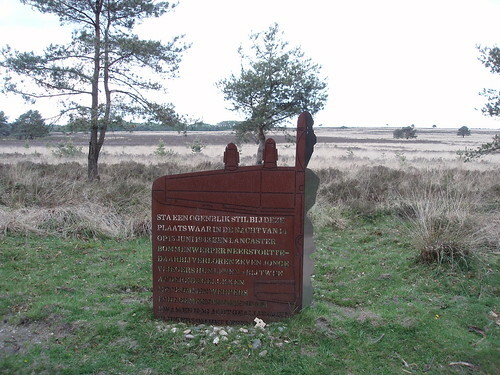 Other afternoon commemorations will take place at sites in the Veluwe forests where resistance fighters were summarily executed during the Second World War. Initially a sunny start, but cloud has increased as the afternoon progressed. Temperature at Deelen aerodrome, 6 miles north of here, is 17C / 63F. The repercussions of Thursday's attack on the Queen's Birthday parade in Apeldoorn continue to be felt. It was reveiled today that the attacker died of brain damage. Traces of cannabis were found in his system, but no alcohol. It should be pointed out that cannabis can remain in the body for weeks after last use. Cannabis, however, is also known to precipitate psychotic events in people with a predisposition towards that. Whether this contributed towards Mr Tater's act is unknown and only speculative at this stage. Members of the Royal Family are visiting the injured in hospitals in Amersfoort, 27 miles west of Apeldoorn, and Arnhem, a few miles from my position. Public discussion, including on national television, is continuing apace. The residents of Huissen, the city where Mr Tater last lived, are getting mighty fed up with the attention of foreign media. Huissen is not a large place, located a few miles southeast of Arnhem on the banks of the Rhine river. 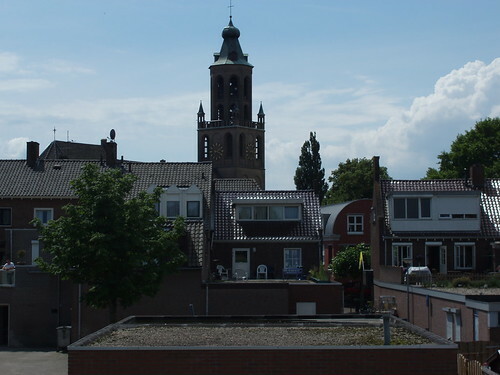 Huissen, as pictured by myself on 13 July 2008. The name of this city, which lies just 16 miles north of my current position, has become synonymous with the mindless attack on the Royal Family and the associated Queensday celebrations, that all in Holland are so used to. 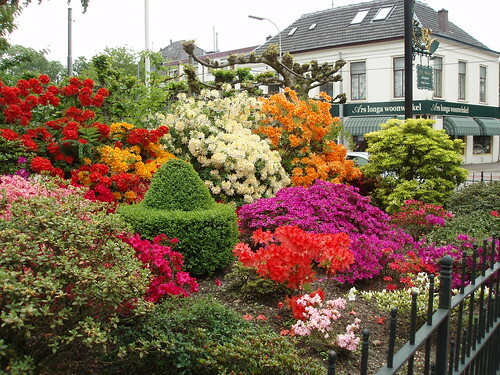 Apeldoorn, a leafy city of just over 140,000, has long associations with the Dutch Royal Family. The 19th century King Willem III resided there in Palace 't Loo, as did his daughter and eventual successor Queen Wilhelmina, who became famous during the Second World War. Yesterday was to have been a joyful celebration of the 100th birthday of Queen Juliana, who ruled Holland from 1948 to 1980. Queen Beatrix and her family were touring Apeldoorn, at first on foot, later in an open-topped bus. Just as they were approaching the Palace 't Loo, the attack took place. Seven people have died. The culprit died at 3 am this morning, but 5 bystanders had lost their lives by that time, one being a child. A Military Policeman died this afternoon, bringing the total death toll to seven. The corpse of the attacker has been transferred to the Forensic Laboratory in Rijswijk, just outside The Hague. His every move on April 30th, 2009, will be retraced and reconstructed, from the moment he left his bed to the point he crashed. 250 police have been assigned that elaborate task, which will probably take several months. At the end, it is hoped a motive will have been found. Just after he crashed, the attacker told police he wanted to attack a named member of the Royal Family - that name has not been released. Today, people have come to Apeldoorn and the location of the attack. Many said they had not been able to sleep, and needed to 'do something'. A register of condolence has been opened on the Internet. If you want to sign, feel free to visit this site. Click on the link marked Condoleance toevoegen [add condolence] to leave your message. So, there we were at 1 o'clock this afternoon. Eleven members of the family, gathered at my mother's graveside. A few minutes before, a year ago, my mother had suddenly passed away. The sun beamed down, the mercury was at the 70F mark and gentle breezes stirred the leaves on the trees in the cemetery. Flowers were left in vases, the variety that have a pin to stick them in the ground with. Pots of flowers were also left, if only because my mother was fond of plants and flowers. A year has passed. It went by so quick in retrospect. Yes, I miss my mother, and I'm not denying that for one second. But I have good memories to hold on to, to counterbalance the sad ones. A bright, sunny and warm day out here in Holland. Happy May Day if you celebrate. The man who made an attempt on the life of members of the Royal Family in Apeldoorn has died of his injuries. The shock of the incident continues to reverberate around the country. Today, I am remembering the death of my mother, one year ago today.